The King and Queen were especially devoted to the Lord Vishnu. They performed sacrifices, and gave away gifts to holy men, and food to the poor, all in the name of the Lord. When our story opens good King Ambarisha and his faithful Queen Shrimathi had undertaken a vow to the Lord. For one year they would not eat or drink on Ekadashi, the eleventh day of each month. During this special year, when each Ekadashi approached, the King and Queen and hundreds of their followers, would prepare themselves in a field near the palace, and spend the special day saying prayers and singing songs praising Lord Vishnu. Just before midday, on the day after Ekadashi, the King and Queen, and all their devoted followers, would enjoy a hearty meal. This was a joyous occasion, and many people came from far and wide to partake of the lavish feast. When the year rolled around, and King Ambarisha and Queen Shrimathi were engaged on the last of their Ekadashi fasts, the Lord Vishnu himself looked down from Heaven, to enjoy the sight of his great devotees performing their final holy ritual. The crowds that arrived to enjoy the last feast were a wonder to behold! 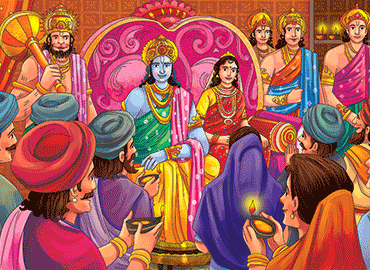 All of King Ambarisha and Queen Shrimathi’s devoted subjects were there. They were joined by thousands of others, who had come from hundreds of miles around. And the food! Nothing like this had ever been seen! There were mountains of succulent fruits, wide platters piled high with fragrant rice, steaming cauldrons of dhal, and many other delicious dishes. The smell of spices and seasonings wafted through the air, filling everyone with delightful anticipation of the great meal to come. On the morning that our tale begins, on the very day that the last Ekadashi fast was to finish, King Ambarisha and Queen Shrimathi were listening to the ranks of priests intoning prayers to Lord Vishnu. People spoke quietly, priests chanted, and the wind gently rustled through the trees. Suddenly, everyone heard the sound of brass bells, and the low humming, and the rhythmic footsteps of an approaching group of holy men. The King and Queen looked out to see who was coming. It was Sage Durvasa! Accompanied by his one thousand followers. The King and Queen immediately rose from their seats, and approached Holy Durvasa with hands held together in respectful greeting. Durvasa was well known as a giant of devotion, and a master of scripture and ritual. He was also well known for his very short temper! Everyone feared his mighty fits of anger! The King and Queen bowed low to the holy sage, and welcomed him with all their hearts. The King and Queen happily resettled themselves near the sacrificial fire, as Durvasa and his followers disappeared down the path to the river. But the time drew on, and midday approached. Still there was no sign of Sage Durvasa and his one thousand followers. The King and Queen’s advisers grew anxious. If the meal began before the holy man had returned, they would offer him a mortal insult. If they delayed their meal until after midday, then the power of the Ekadashi fast would be lost, and the Gods themselves would be angry! What were they to do? As the minutes ticked by, and midday drew near, Holy Vasishtha, one of King Ambarisha’s trusted advisers, came up with a plan. The King was delighted with this plan, and took the tulsi leaf. At one minute before midday he placed it on his tongue. But just at that moment, Sage Durvasa returned and saw what was happening. He was enraged! Everyone, except King Ambarisha, cowered in fear. But Durvasa would not listen. He angrily plucked a hair from his head. He said a magical incantation over the hair, and threw it into the air. As it fell to earth, the hair transformed into a ferocious demonness. She had green skin, with lumps and blotches. She had a pointy nose, and sharp black teeth. Her red eyes rolled around madly in her head. On seeing King Ambarisha, she let out a delighted cackle, raised her wicked talons, and ran towards him. But Ambarisha, firm in his devotion to Lord Vishnu, stood calmly, his hands together, ready for whatever fate had in store. Meanwhile Lord Vishnu, looking down from heaven, saw the peril of his great devotee. He held up his right index finger, and on it appeared the Sudarshana Chakra, a revolving wheel of fire with a razor sharp edge. The Chakra flew from his finger down to earth. Queen Shrimathi, and all of King Ambarisha’s devoted followers looked on in horror, as the demonness ran towards the King, opened her mouth wide, and stretched out her sharp claws. But, before she could reach the King, the holy Chakra of Vishnu flew out of the sky and struck the demonness in the chest. She exploded in a cloud of green smoke. Everyone was thunderstruck at this turn of events! But, imagine their amazement, when the Chakra, spinning and spitting flames, turned on Sage Durvasa! Seeing his demonness reduced to ashes, and the flaming Chakra now racing towards him, Durvasa turned and ran for his life. Durvasa raced here and there. He plunged into rivers, and he climbed steep mountains. He ran through dark jungles, and he sped over dry deserts. Everywhere he cried out for help. But who can help when the Lord himself is after you! The spinning, flaming Chakra of Lord Vishnu followed Durvasa everywhere he went, and found him in every hiding place. Sparks from the Chakra burnt his robes and singed his hair, and once, when he slowed down, a spark even burnt his bottom! Durvasa yelped, and sped up to escape the fearsome spinning disc. He ran for a year, until finally he thought of a plan! He raced to the heavenly abode of Lord Brahma the Creator, and his Queen Sarasvati. Breathlessly he threw himself face down before them, and begged for their help in warding off the Chakra of Lord Vishnu. So Durvasa raced off to the dwelling place of Lord Shiva, and his Queen Parvati. Durvasa nearly sobbed with relief. Of course! He ran to the heavenly palace of Lord Vishnu himself, chased all the way by the razor sharp Chakra. The Lord was seated beside his Queen Lakshmi. Durvasa immediately begged them for forgiveness and mercy. So Sage Durvasa, chased by the spinning, burning Chakra every step of the way, instantly made his way back to King Ambarisha. By the power of the King’s devotion, nothing had changed in the year since Durvasa had run terrified from the Lord’s Chakra. The food remained fresh, and everyone waited in perfect peace. King Ambarisha stood patiently, as Sage Durvasa ran up to him and threw himself at his feet. King Ambarisha willingly forgave Durvasa. He prayed to the Lord Vishnu for Sage Durvasa’s life, and the Chakra immediately vanished. Everyone proceeded eagerly to the banqueting hall of the palace to eat and drink. Sage Durvasa was seated next to the King and Queen. Although offered a bathe in the river, and a change of clothes, Sage Durvasa, this time, preferred to sit next to the wise king, just as he was, covered in dust, and in his singed robes.